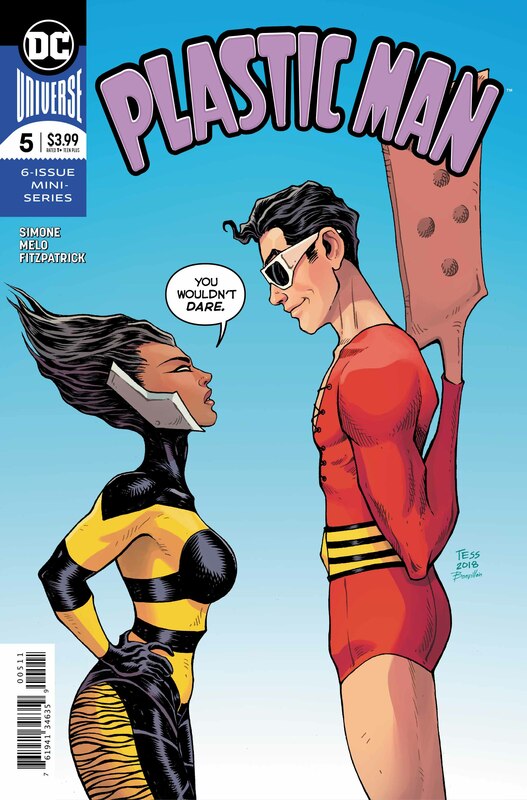 Plastic Man #5 Review – AiPT! The penultimate issue is here and it’s fun, but I’m worried. The final act of Plastic Man is rapidly approaching and I’m still very much enjoying this book. This is one of my favorite current books on the shelves, but it has problems just like everything else — problems I’ll go into later. Overall this issue is solid, besides some minor problems and has some funny writing by Gail Simone as well as some fun little visual gags by Adriana Melo. So as I mentioned before, I have a problem with the issue. We’re five issues out of six in and it still feels like there’s quite a bit to go. Eel has to confront the Cabal, fight the current adversary that is revealed in this issue, have a confrontation with Granite Janet, wrap up and decide where he’s going with the Suave Prince and deal with the fact he’s lost the respect of the dancers at his club. That’s a lot to have to package into one final issue and it makes me nervous for how well the final issue is going to be able to execute it. I have faith in Simone and Melo to pull it off, but there’s still that nervousness that it might not stick the landing. The actual content of the issue is great as usual with some cameos by Crazy Quilt and Mister Terrible being complained about by the Cabal. The banter between the members of the Cabal themselves is a fun time and is well written by Simone and illustrated greatly by Melo. I just wish we’d had more time to develop them out a bit more to really see what their plans are. The trip to the pier that leads to the Suave Prince being handed to child services was an example of Eel really hitting his lowest point, which is exaggerated by the fact that the one person who thought he was a good guy turns against him for this. Even Eel knows that this was a mistake as he’s isolated himself from everyone who cares for him. The kid that idolized him and even said that they love him like a father figure and the dancer who was smitten by him now thinks he’s as scummy as the rest of his employees. Overall, this is another great issue. My only worry is that there are a lot of story threads still in the air with only one issue to go — hopefully Simone and Melo can stick the landing. A good penultimate issue that leaves the problem of a lot to tie up in the final issue. The writing by Gail Simone is fun and emotional as always. Adriana Melo's art continues its fun and cartoony feel. The relationships in the side cast are still the best things in the book. There's quite a bit to be wrapped up next issue, which has me concerned.